The Pinot Gris in the Heimbourg is planted right at the top of this little single vineyard in Turckheim (only 9ha in total and we own 4.5ha). The top part of the vineyard is quite steep and years of erosion have left little top soil and quite a lot of calcareous rocks. It is also a vineyard, which is quite exposed to the winds. These are perfect conditions for late ripening and keeping the grapes healthy late in the season, so there is no rush in going early to harvest them. 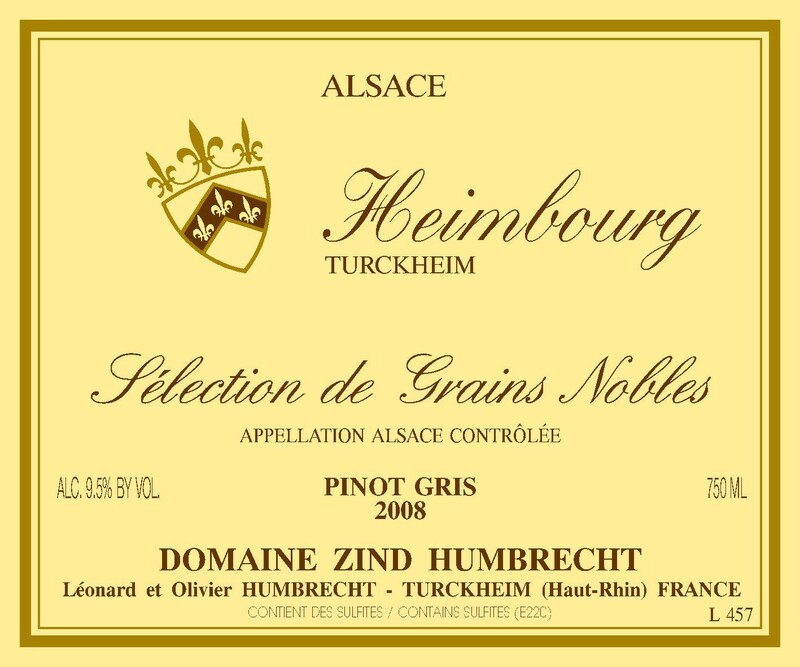 These are also tough growing conditions for the delicate Riesling grape or the Gewurztraminer that enjoys more protected and warmer locations, which explains the choice of Pinot Gris there. Just like in the Rotenberg, we were able to do a selection of healthy clusters in order to produce a drier style wine, and ten days later, we went to harvest the remaining botrytis affected clusters. Same surprise, it was classic SGN richness. The huge acidity (7 g/l or 10.5 g/l in tartaric acid is really big and almost unbearable on a dry wine) slowed down the fermentation and made the wine keep quite a lot of residual sweetness. 2/2010: the botrytis was so clean in 2008 that the colour of the wine remained quite clear. (This is also the effect of low pH for such rich wines). The nose is very mineral and it is almost hard to guess the richness. It takes quite a long time for this wine to open up, but eventually it shows wonderful crisp citrus fruit on top of the complex minerals. The combination of lower alcohol, high sweetness and very high acids creates a perfect mouth feel and elegant finish. These SGNs will last a long time!